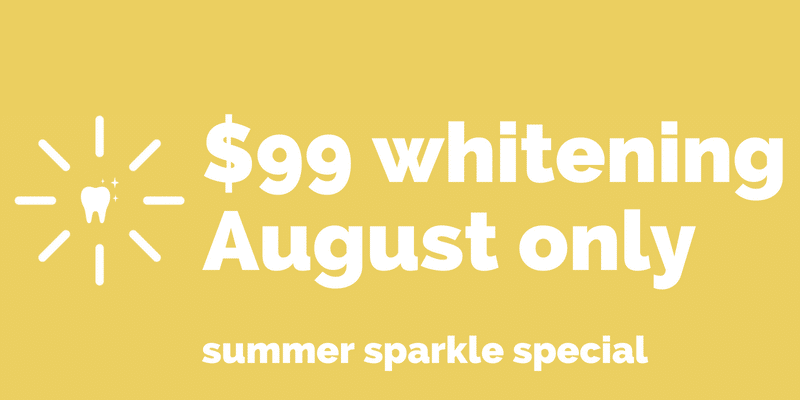 During August, we’re excited to offer the option of adding a $99 at-home whitening kit to your dental wellness visit. At your appointment, you can be fitted for totally custom whitening trays to use with our professional strength whitening gel. You’ll come back to the office a few days later to pick up the trays, along with two tubes of Opalescence gel. Then, every evening you’ll apply a thin layer of gel to the tray, and wear it in the comfort of your home for about a week. Just like that, you’ll have brilliantly white teeth for all your summer plans! This offer is only valid at a scheduled dental wellness visit, not as a stand-alone appointment or a treatment appointment. If you’d like whitening trays and gel without a dental wellness visit, consider our Whitening For Life option ($199) which includes whitening trays, four tubes of professional strength Opalescence gel, and gel for touch-ups as long as you’re up to date on your dental wellness appointment. Not everyone is going to be a good candidate for whitening. If you have certain restorative work like a veneer or crown on a front tooth, or if you have gum disease, the whitening process is probably not for you. We’re only able to extend this offer to people for who whitening is an appropriate procedure. We can’t guarantee the results of this special summer whitening. Most people do see a dramatic improvement after using two tubes of whitening gel, but everyone is different.